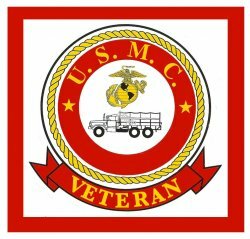 United States Marine veteran Sticker - $10.00 : Bob Hoyts Classic Inspection Stickers, Add a Final Touch to your Restoration! This approximately 3 inch by 3 inch window sticker signifies a United States Marine Veteran. A fitting sticker to remind folks of our fighting heroes in all wars. It also can be ordered as a regular sticker that goes on the outside by simply indicating oyu want the "outside" sticker. While the outside sticker does have a vinyl outside coating it is not guaranteed to have a long life outside of a garage kept vehicle.